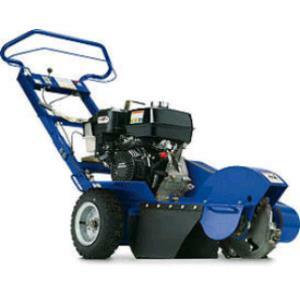 Equipped with a 13HP engine, the stump grinder is a perfect tool for your small to mid-size stump grinding job. Your stump should be cut down to 6" in height or less, and the machine can let you grind objects down to 12" below the ground. The eight cutting teeth contain three independent edges, which allow you to rotate them once dulled to complete your job. The machine also features an ergonomic handle that adjusts to 4 height positions, as well as a convenient braking system that locks in the left wheel to allow pivoting over the stump. Please note, a deposit is taken on the teeth and teeth holders. * Please call us for any questions on our stump grinder rentals in Hillsdale and Ridgewood NJ.